Norwalk, CT - On Wednesday November 14th, a record 700 home building industry professionals attended the 19th annual HOBI Awards Gala at the Aqua Turf in Southington. Sponsored by the Home Builders Association of Connecticut, the HOBI Awards has been the state’s most prestigious home building industry awards program, recognizing builders, remodelers and developers throughout Connecticut for excellence in design, construction, remodeling, and land development since 1993. 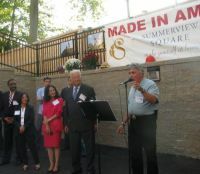 At the dinner, Summerview Development Group was presented with three home building industry awards for their Norwalk rental community, Summerview Square. Summerview Square won awards for Best Affordably Priced Rental Community, Best Rental Unit and Best Fairfield County Smart Growth Community. Four leading home building industry professionals reviewed close to two hundred new construction applications, and then toured some of the custom homes and communities entered. 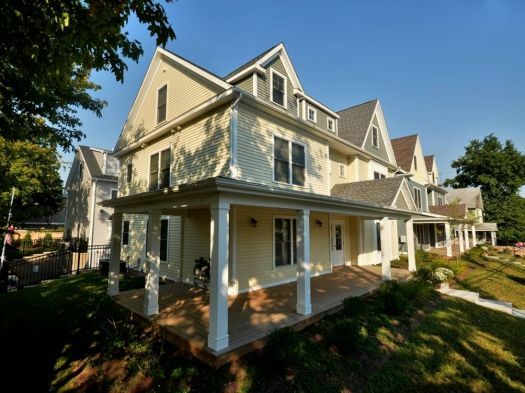 The HOBI judges were particularly impressed by the positive effect this infill community has had on its West Main Street neighborhood; the fact that it is Norwalk’s first green infill community; and that it’s constructed with Made in America building materials. Three years ago, Fairfield County builders, Andrew LaSala and Steven Berko of Summerview Development Group, were hired by Westchester asset management company, Seavest Inc to develop four land parcels in a run down neighborhood of Norwalk bordered by West Main and Summer Streets. Today, construction is underway on the last phase of the 63 unit rental community known as Summerview Square, and this once blighted neighborhood has been rejuvenated. Affordably priced rents at Summerview Square range from $1,500 to $2,500 per month. The 2,200 sf three bedroom three story townhome which was recognized as 2012 Best Rental Unit features hardwood floors, an open kitchen family room and a 3rd floor master suite, as well as a laundry center and a two car heated private garage. Norwalk Development Director, Tad Diesel believes that moderately priced housing like Summerview Square is vital to retaining and attracting businesses. “New businesses have opened and neighborhood restaurants are thriving. I think the Main Street area will continue to experience an uplift as the last phase of Summerview is finished,” said Diesel. Celebration” in September. State Representative Gail Lavielle (R-143) in red suit. Norwalk Mayor Richard A. Moccia remarked, “Summerview Square was developed in a way that makes Norwalk proud. The project has been an opportunity to build beautiful apartment homes for people, and to improve the value of homes in the area."